Factor 10 helped CRC Global Solutions create a brand that captured their experience and professionalism. Starting with in-depth research and analysis, we uncovered avenues for long-term growth and advised them how to achieve their maximum potential with a new business strategy, print, and digital design.  FACTOR 10 seamlessly integrates the world of design and business. We use high level data metrics and in-depth analysis to optimize your business operations and grow profit margins.